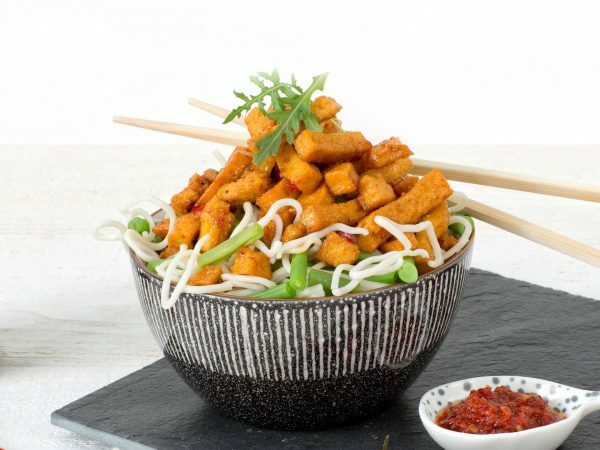 These vegan Spicy Tofu Strips are made from soybeans and are therefore purely vegetarian. The Tofu strips are easy to prepare and combine readily with existing recipes. Soybeans 48%*, water, sun flower oil, vegan coagulant (E516), herbs and spices, salt, vegetables (onion, garlic), yeast extract, thickener (xanthan gum, guar gum), acid (citric acid). *Of biological origin. Frying pan: 3 min. on a low fire. Stir every now and then.